Stately 5 bedroom 3.5 bath Queen Anne Style Victorian in the heart of Portland's West-End. Lovingly restored and thoughtfully updated with attention to every detail. 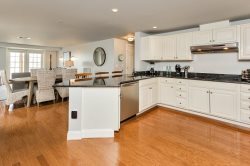 Main level offers a stunning kitchen with high end stainless appliances, marble counter tops and walk in pantry. Off the kitchen is a wonderful sitting room with built in shelves and cable hook up. Formal dining room is perfect for hosting during the holiday seasons and is open to an expansive formal living room. Second floor includes three bedrooms and a full bath with a beautiful tiled walk in shower. Third floor includes 2 additional bedrooms and the third full bath. Home has had a complete window restoration and has an efficient heating system. Enjoy the beautiful details of this historic home with all the amenities of a new property. Private driveway parking, decks as well as a lovely rear garden/patio. Enjoy the neighborhood amenities just steps from your door such as restaurants, coffee shops, theater, trails and park. Ideal for families attending Wayneflete looking for an easy walk to school. A rare offering in Portland.